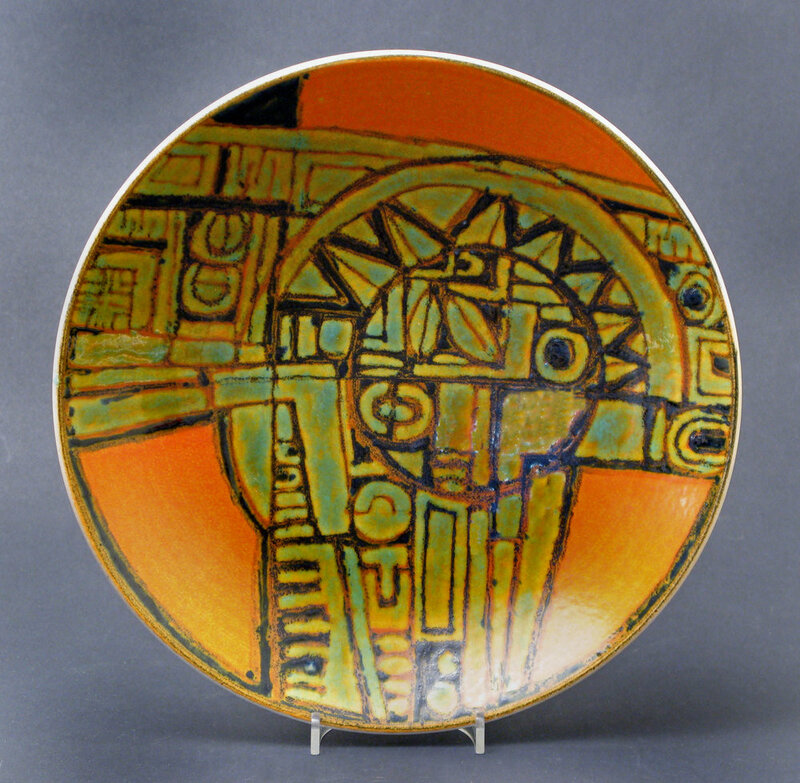 Most serious collectors of post war Poole would acknowledge that the early sixties was the most creative era in the history of the Pottery. On a national scale this was an era of massive social change born out of a reaction to wartime austerity, drabness and utility design. Beliefs traditions and stereotypes were challenged as music art and design embraced the optimism of a post-war generation. 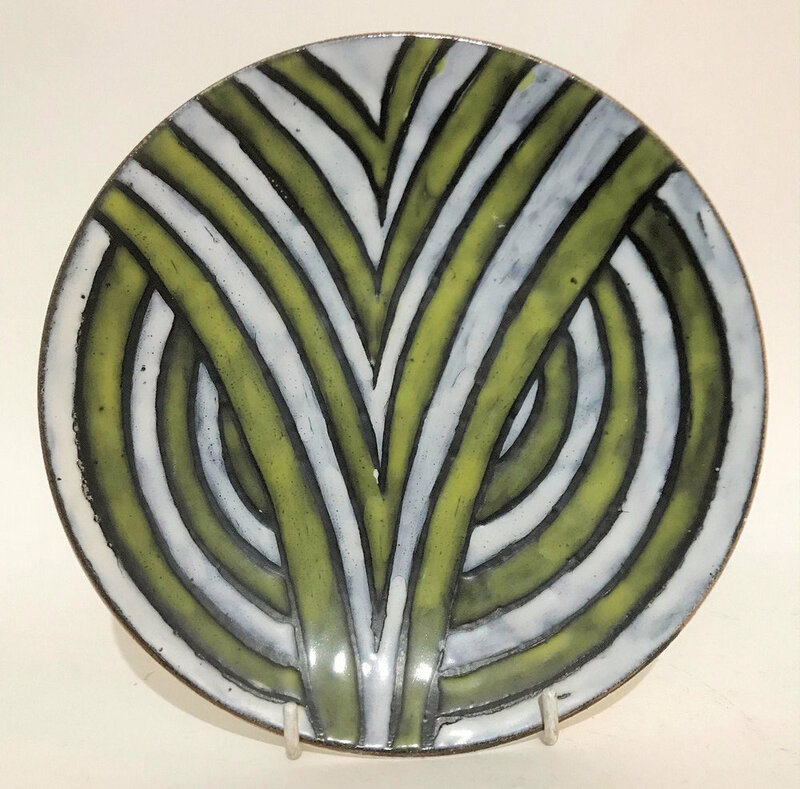 Robert Jefferson, a former lecturer in ceramics at Stoke-on-Trent College of Art, was appointed designer at Poole Pottery in 1958 and is credited with the development of the Poole Pottery Studio. A designer rather than a thrower, Robert Jefferson worked alongside Guy Sydenham, the manager of the ‘making department’. 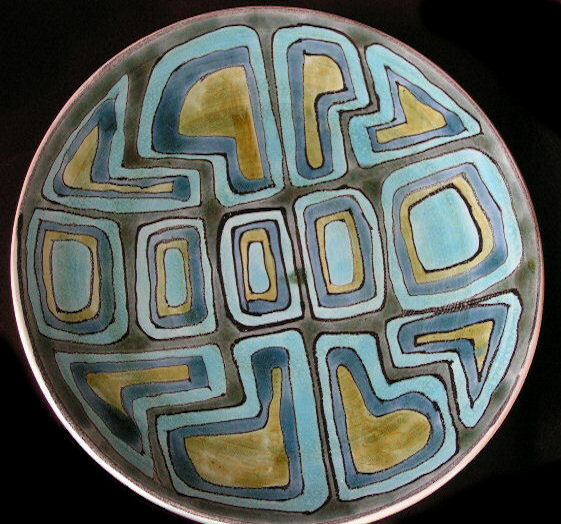 The use of the latest glazes and experimental techniques (such as wax-resist) aided the development of new products and helped to preserve the unique identity of the Pottery. No doubt there was also perceived to be a niche market for highly individual works of art (the retail cost of one plate would be more than a weeks wages for the artist). 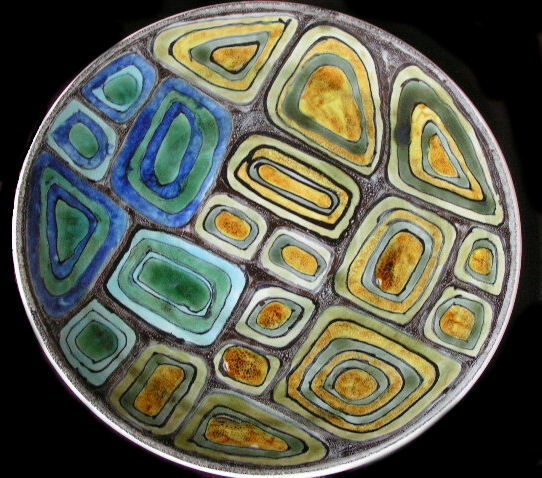 Above - an early and spectacular oval studio plate signed by Robert Jefferson and showing use of wax-resist and an experimental burnt amber 'aventurine' glaze - a supersaturated solution comprising metallic oxides and rutile (a natural mineral composed primarily of titanium dioxide) which formed crystals as it cooled in the firing process to produce a sparkling effect under bright light. 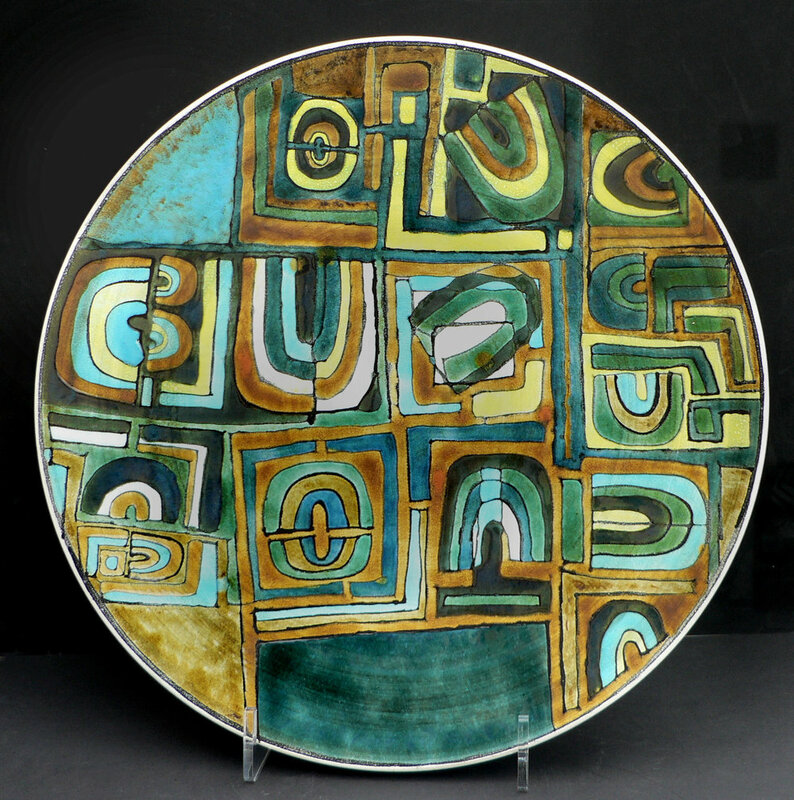 Above - 10 inch plate by Robert Jefferson, 1962-64, the top panel showing the use of an aventurine glaze. Tony Morris suggested that the design may depict a circus. 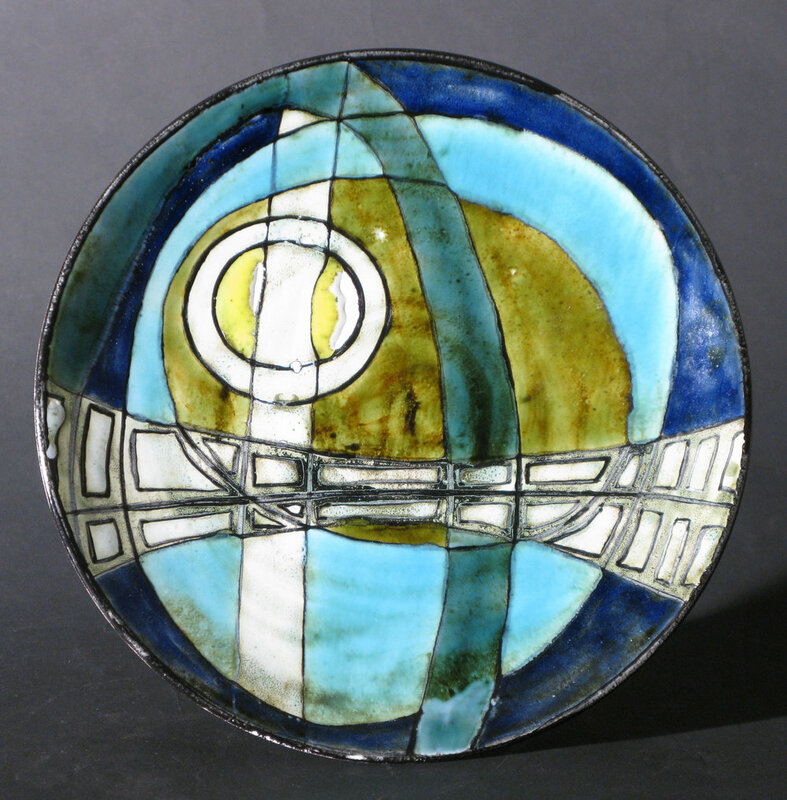 Robert Jefferson and Tony Morris used all of the glazes available in the factory at the time; some were new and experimental, others were borrowed from commercial applications. 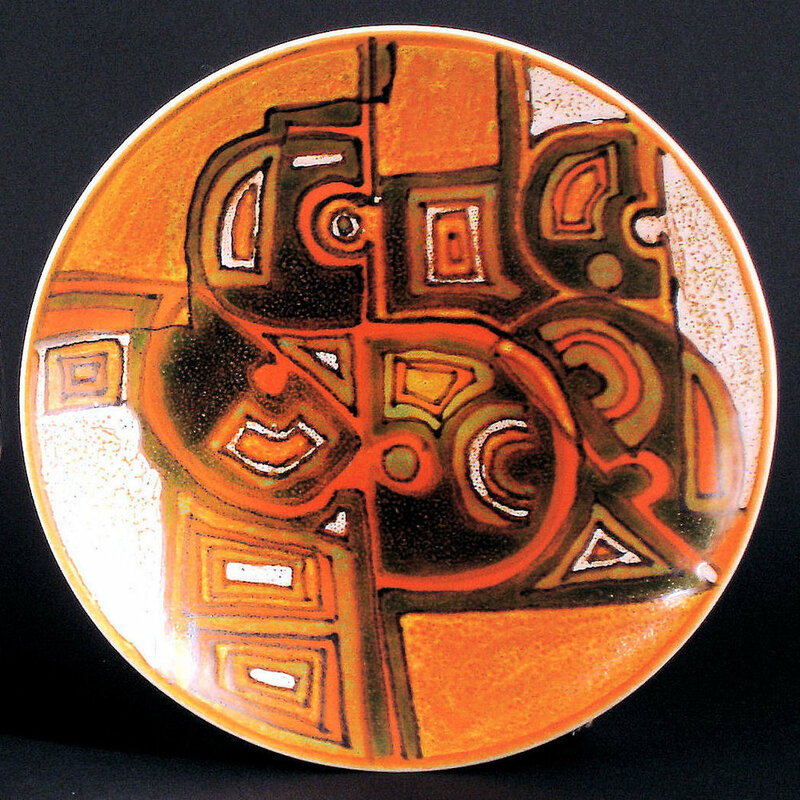 Note the use of the Red Indian glaze above (and in some of the Tony Morris designs below); the glaze is more often associated with the Twintone range and freeform designs from the 1950’s. Above -two dimensional seagulls, Robert Jefferson. 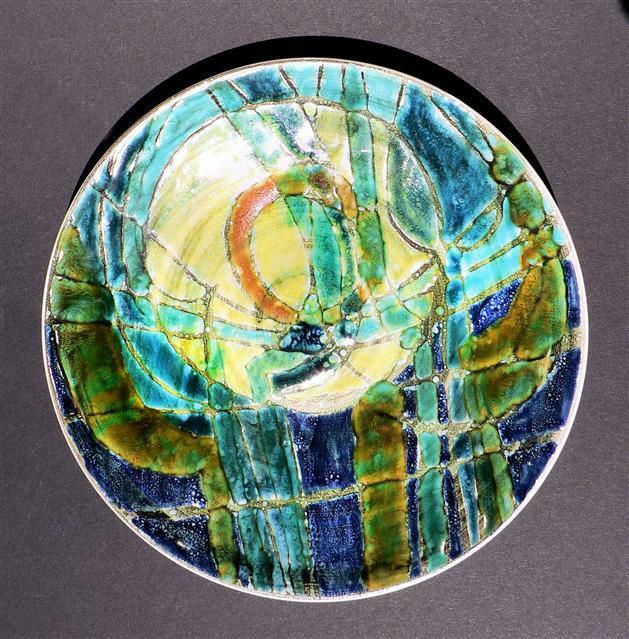 Above - the first wall plaques designed by Robert Jefferson were hand decorated in the available studio glazes. The designs were 'transferred to the production departments when greater output was required '(Hayward and Atterbury). Launched as the 1964 'Spring Collection' the plaques were then produced in the (much more common) standard colours of blue and green (above). 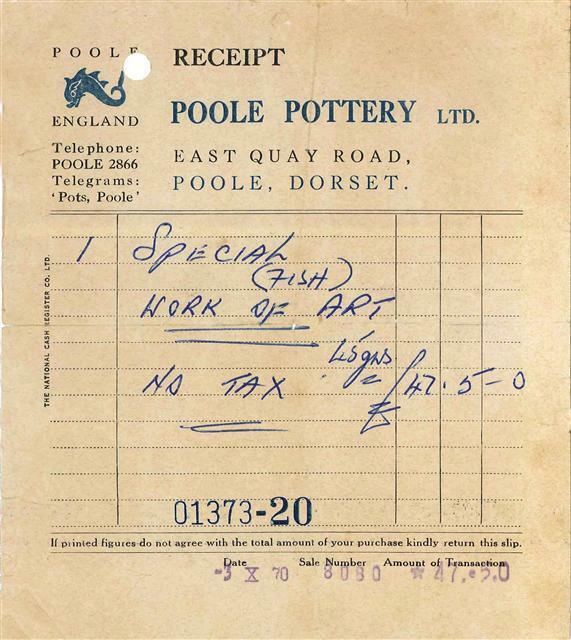 A vacancy at the Poole Pottery Studio was advertised at the Poole Employment Exchange in 1962 and details were passed to other employment exchanges throughout Britain. In South Wales the vacancy came to the attention of Tony Morris. 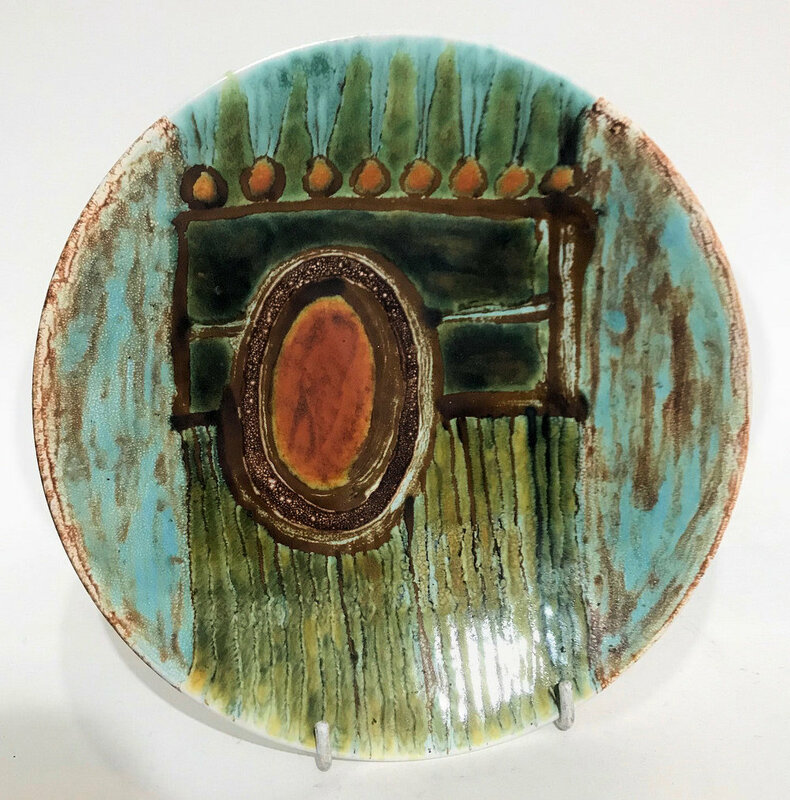 Newly qualified from Newport School of Art and with no previous ceramic training, Tony was recruited by Robert Jefferson on the strength of his painting. Above - Tony Morris study for Carters' tiles. The influence of Tony's Welsh background can be seen in some of his early pieces. Above - mining town New Tredegar in the Rhymney Valley South Wales. Note the coal wagons in the foreground and the use of the Red Indian glaze. 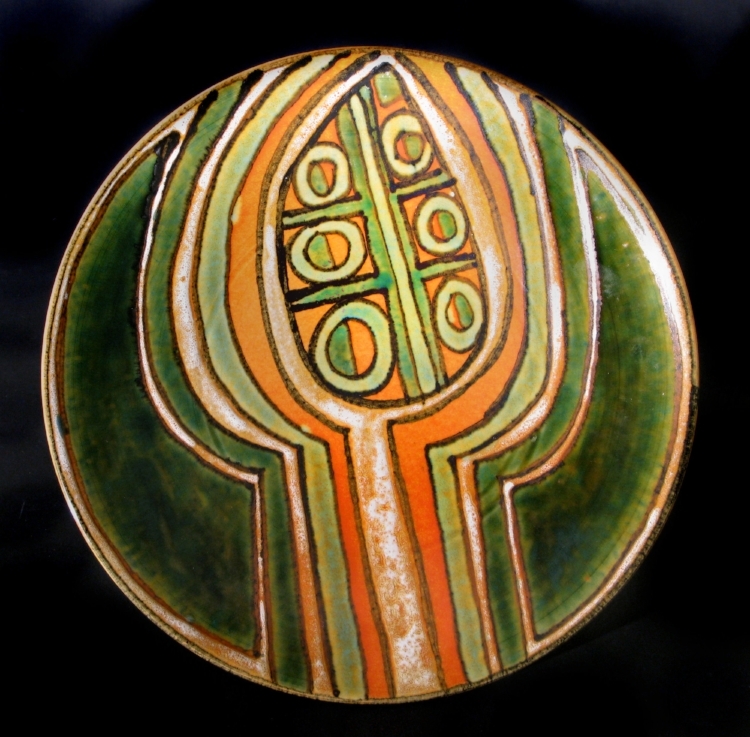 The 10 inch plate was painted by Tony Morris shortly after his arrival at Poole in 1963. Above - a similar view across the valley taken from a contemporary postcard. Elliot Colliery in New Tredegar closed in 1967. At its peak it employed 2,800 people and is said to have produced a million tons of coal a year. Above - New Tredegar with telegraph poles and the colliery blast pipe. Above - early 19th Century Welsh coal miner in wax-resist. 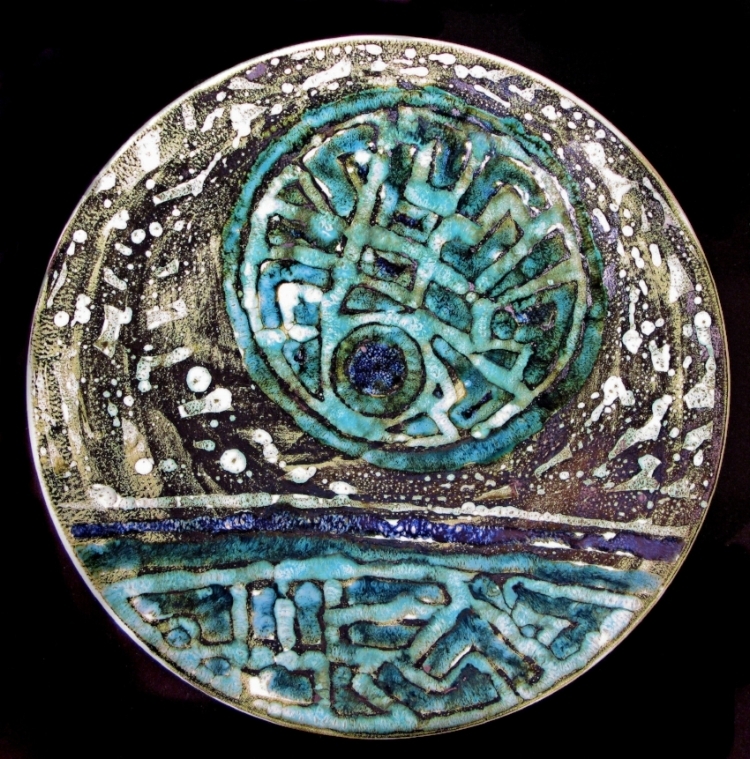 Above - full-sized charger (16.5 inches diameter) by Tony Morris taking its influence from the Tredegar Steelworks and depicting a crucible and channels of molten steel. The retail price of the charger in 1963 was 12 guineas. Tony's weekly wage was 7 guineas (of which 5 guineas was spent on his lodgings). 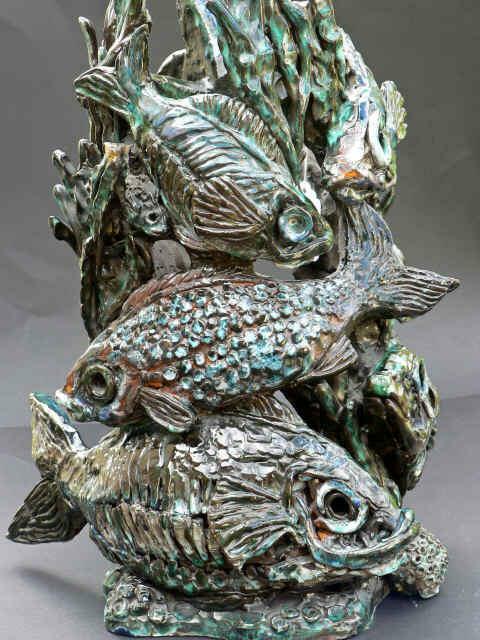 One of Tony's first jobs upon his arrival at Poole was the decoration of 28 faience slabs which were fixed to the Fisherman's Road elevation of the Pottery in 1963. 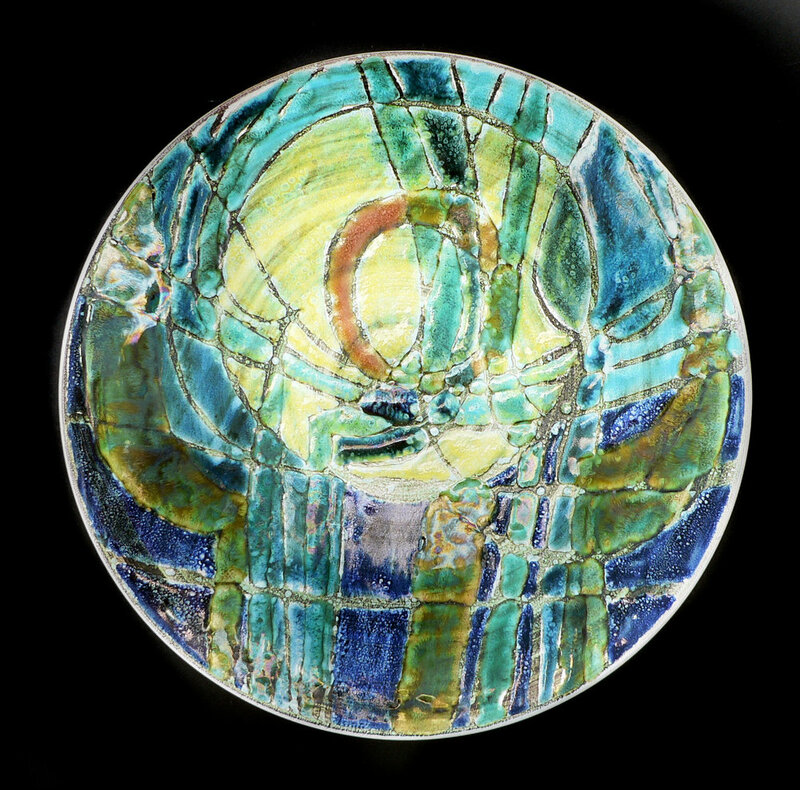 Above - Etched glass and faience slabs at Poole Pottery - Tony Morris c 1967. Following demolition of the former Pottery the faience slabs have been framed and are on display in the (unoccupied) shopping centre on Poole Quay. See images further below. 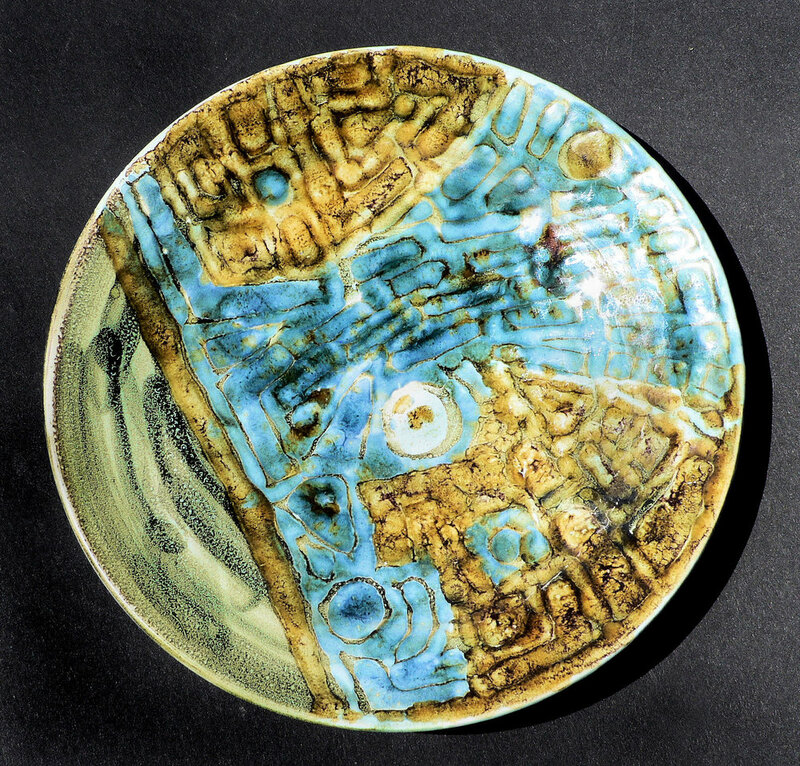 The shallow dishes shown above were amongst the first pieces produced by Tony following his move to Dorset. Tony recalled that this was a time when there was no pressure on the artist to meet production targets. The top left hand dish depicts the crucifixion. 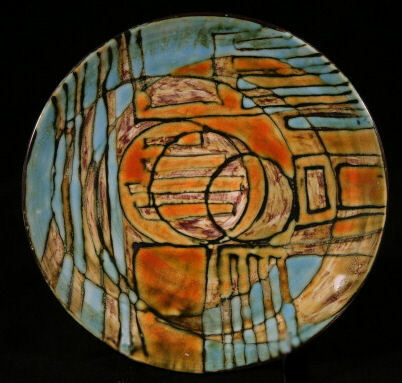 The dish on the right was described by Christies as an abstract harbourscape in their 1993 sale but may be interpreted as a head and body within a key. The dishes are 11 inches wide and retailed at 4 guineas. The 'Snow White' glaze did not like the sharp edges of the rim and the dishes are prone to glaze misses or 'chittering' in the firing which is sometimes mistaken for damage. [Delphis Production 1964-70, a conversation with Christine Tate, Poole Pottery Collectors Club, Winter 1995] . Above - unsigned oval studio plates, 1962-64, all confirmed by Tony Morris as his own. The plates on the top row were attributed to Robert Jefferson by Leslie Hayward and were exhibited at Poole Museum for the launch of the Robert Jefferson book 'the Quiet Virtuoso'. 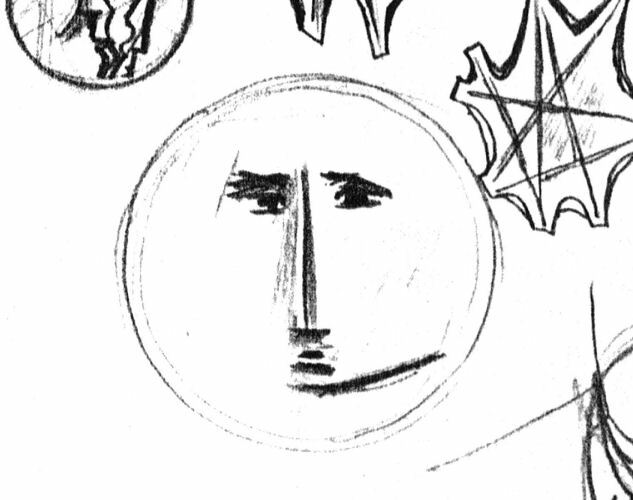 Faces were frequently incorporated into plate designs. 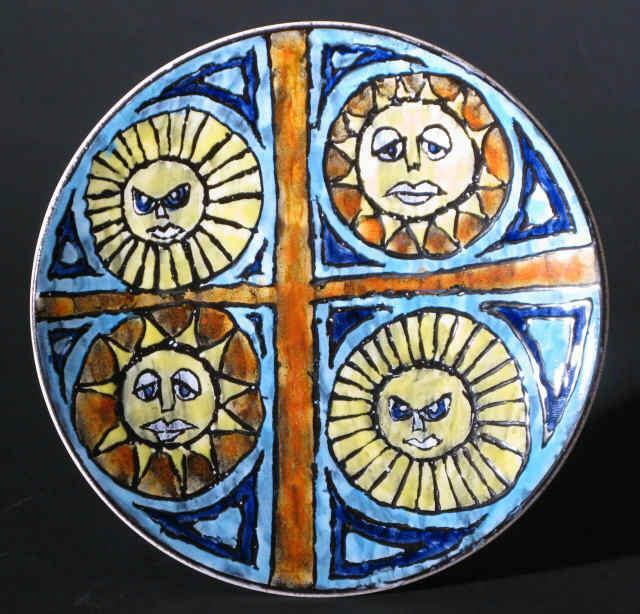 Often described as 'sun-faces' many are wrongly attributed to Tony Morris, although Tony probably produced the best examples. Above and below - sketches by Robert Jefferson, early 1960’s. The caption (right) reads ‘a happy end to the old year and a bright start to the new’. Above - full sized sun-face charger by Tony Morris, 1963-64. Above - unsigned 8 inch plates. 10 inch (top row) and 14 inch (bottom row) plates with sun faces. Top left plate signed by Tony Morris and bottom row plates confirmed by Tony to be his. 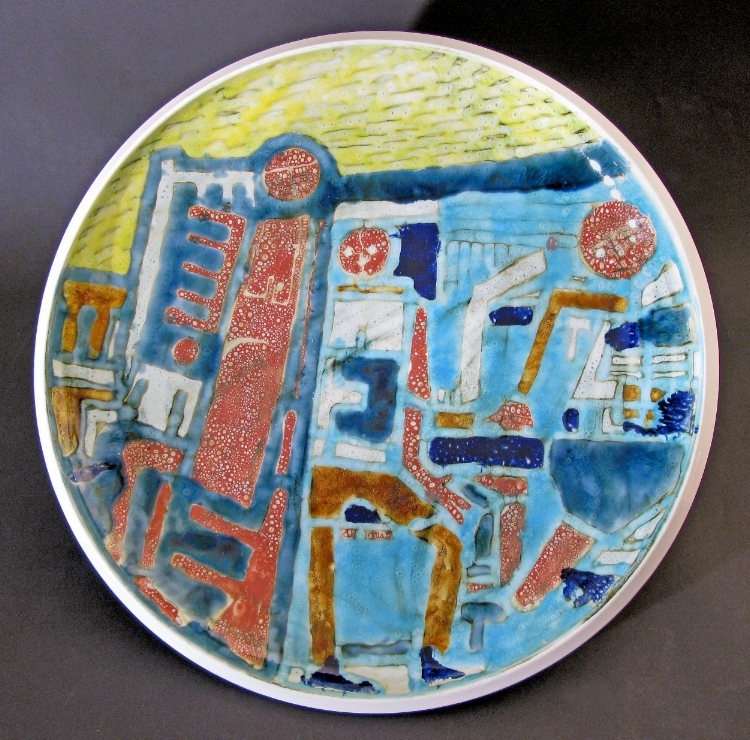 The lower right hand plate brings together a number of elements which are associated with Tony's work in the early 1960's - a sun face, horse shoes, a sheep's head, town plans and a pollarded tree. Further examples of these designs are shown below. Above - shallow bowls, unsigned. Above - unsigned 14 inch charger, probably by Christine Tate. 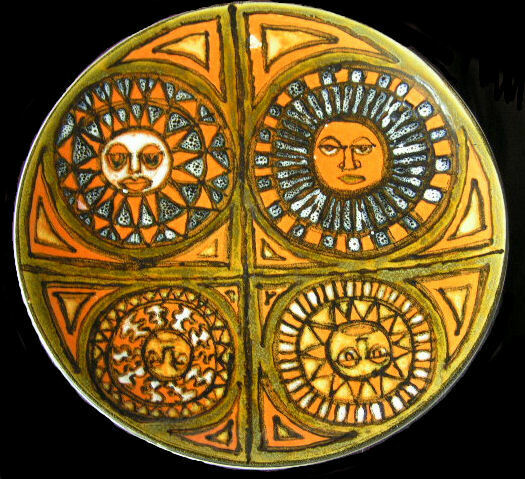 Above - coffee table with sun-faces (Tony Morris). The left hand face is well known to Poole Pottery collectors by reason of its appearance on the back of the dust cover for Hayward and Atterbury's 'Poole Pottery'. The story goes that Tony gave coffee tables as Christmas presents and carried them with him on the coach to South Wales. Pollarding is a traditional means of keeping a tree to its original size by regular hard pruning. This gives rise to new growth, upwards and outwards from the trunk. Above - sun-face through a pollarded tree by Tony Morris. 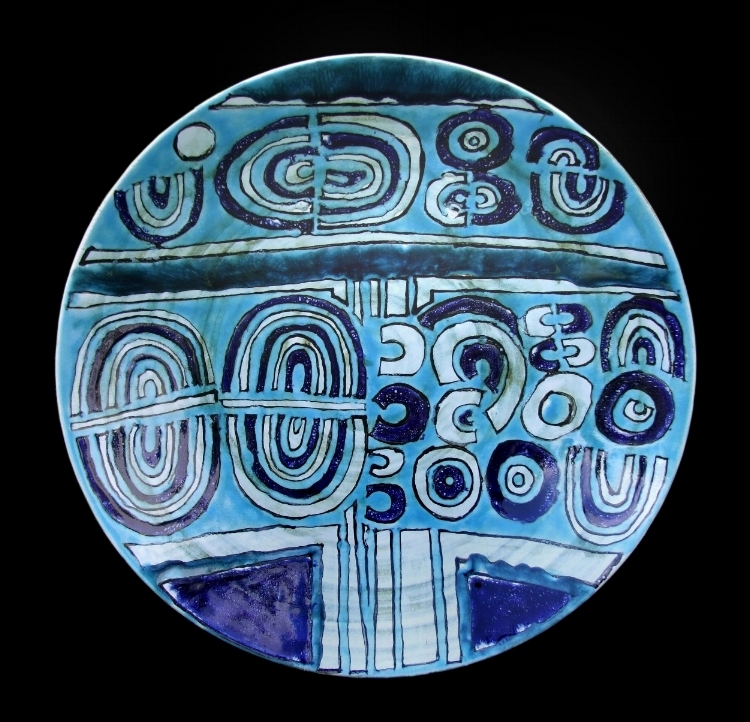 At least one other plate was made with a similar design but with a different glaze. It was quite unusual at the time for studio designs to be repeated. 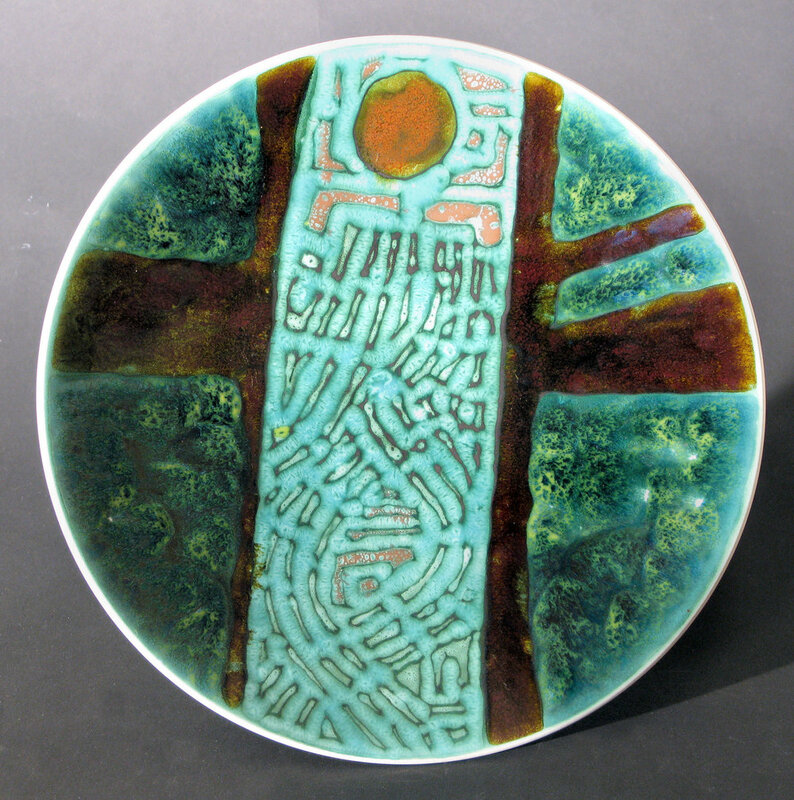 Above - 8 inch plates by Tony Morris with pollarded tree designs. Above - detail from the oval Tony Morris charger above. The branches of the pollarded tree are formed with wax resist giving the piece a stained glass appearance. Above - 14 inch chargers by Tony Morris. Above - pollarded tree with horse shoe shapes, unsigned. 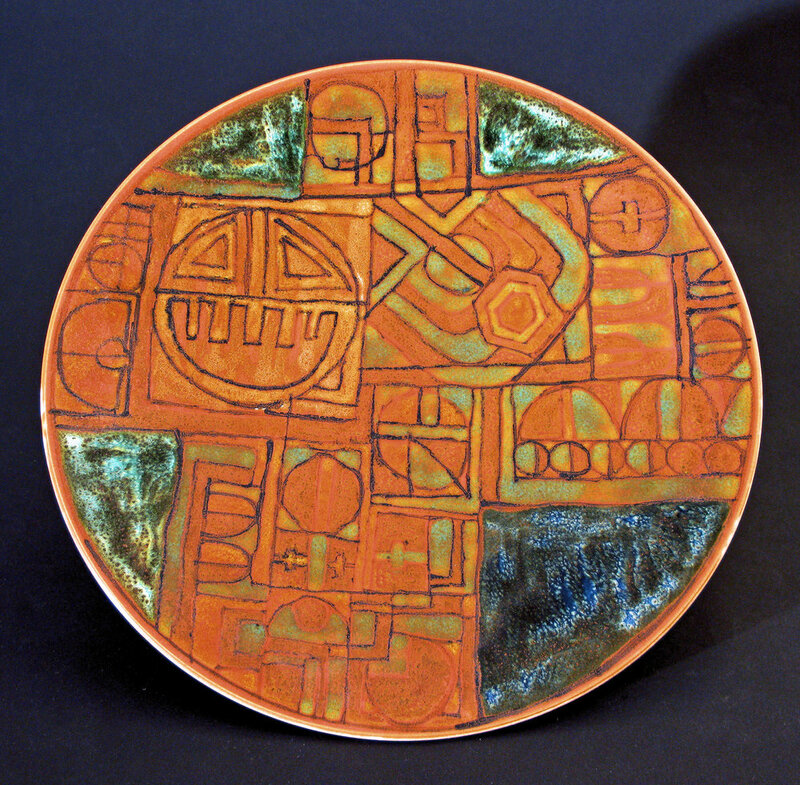 Above - either a 10 inch plate by Tony Morris, or one drawing heavily on his influence. Some abstract designs are defined by their geometric appearance and the use of horse-shoe shapes. 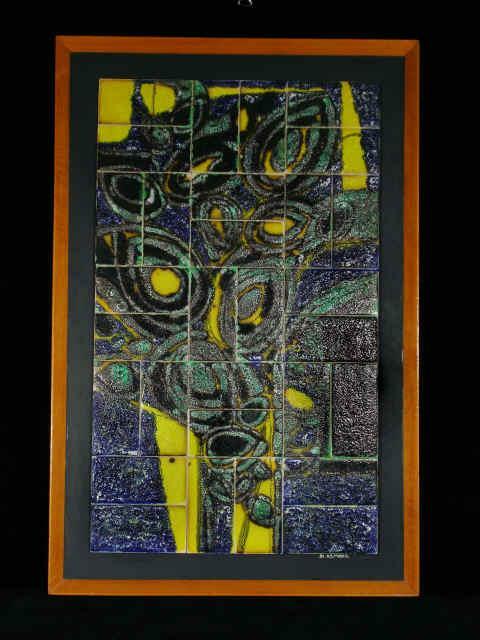 Above - 4 tile panel, Tony Morris. The panel comprises 4 identical tiles made from a mould, each rotated through 90 degrees. 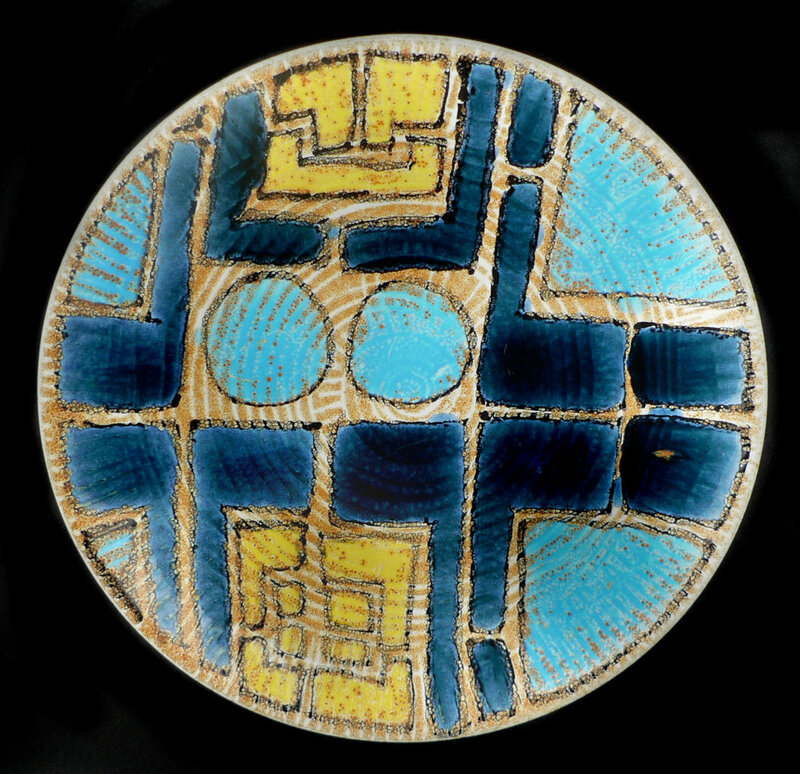 Above - studio plates 1964-1966, unsigned. Robert Jefferson is quoted as saying "I seem to remember [Tony] was fascinated by sheep. If it was sheep, it was Tony" (1993 Harry Lyons exhibition catalogue). The design below is a stylised version of a sheeps head, the downward stroke of the 'T' representing the sheep's neck and the circle to the left being the eye. Above - Uranium orange 14 inch 'sheep's head' design by Tony Morris. The decoration is an abstract progression from the detail on the Poole Town Plan which was on display in the Studio at the time. 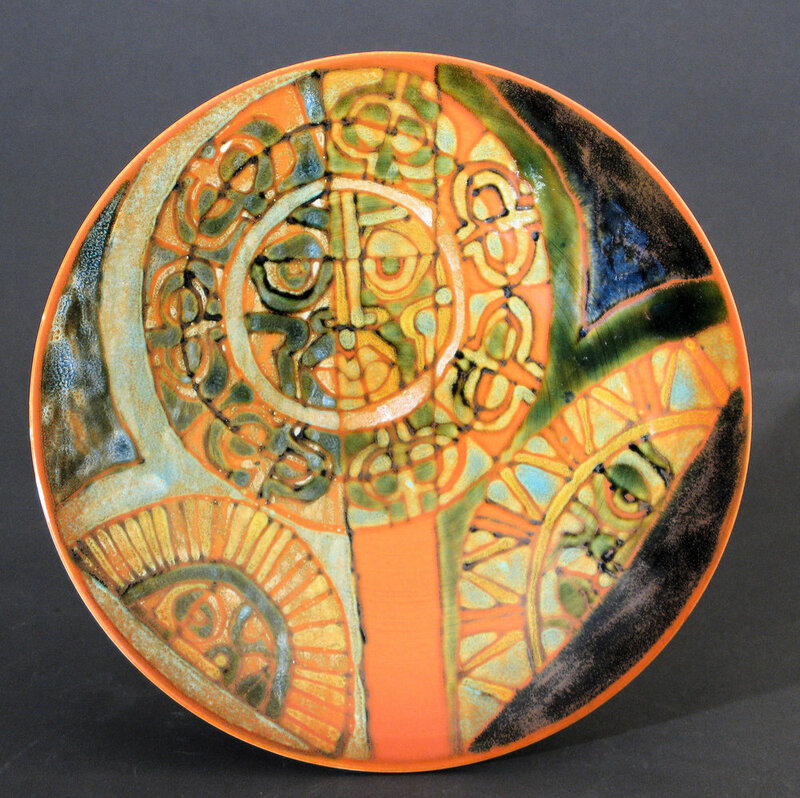 The early orange glazes were made from depleted uranium and are mildly radioactive. Above - all 6 plates by Tony Morris, centre left 10 inches, others 14 inches. Above - 16 inch 'town planning' charger by Tony Morris, 1962-64. Full size Tony Morris town planning charger from the same palette as the plate above. Above - 16 inch charger by Tony Morris, 1962-64. Some designs with their origins in town planning have evolved into images of planets and outer space. 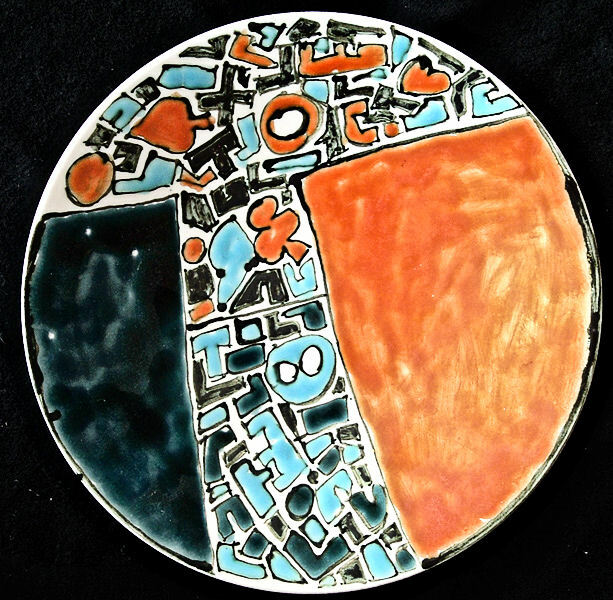 Above - 10 inch plate by Tony Morris. Above - 14 inch charger which depicts the sun setting behind the twin chimneys of Poole Power Station (now demolished) as observed by Tony Morris on his return from a fishing trip out of Poole Harbour. Above - Poole Power station. Tony returned to the subject later in his career. Not all of Tony's work is easily defined. The 14 inch plate above was part of the window display for the launching of the Delphis Collection at Eaden Lilly's shop in Cambridge in October 1963. 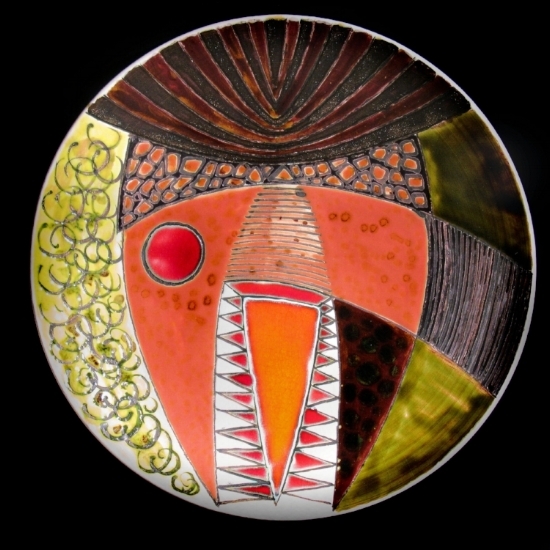 14 inch plate, Tony Morris. 14 inch seascape by Tony Morris. The plate belonged to Roy Holland (the managing director of Poole Pottery from 1962) and is reunited with Tony in the right hand picture. Above - unsigned studio plates. Left hand plate 8 inches, right hand plate 14 inches. 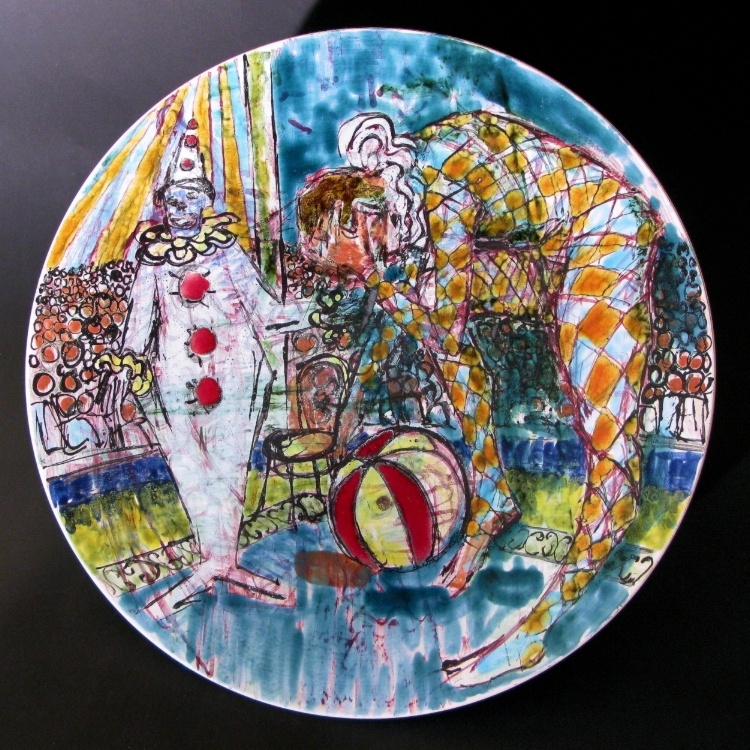 Above - circus plate by Tony Morris (16 inches). Tony described this as the best piece he ever made. 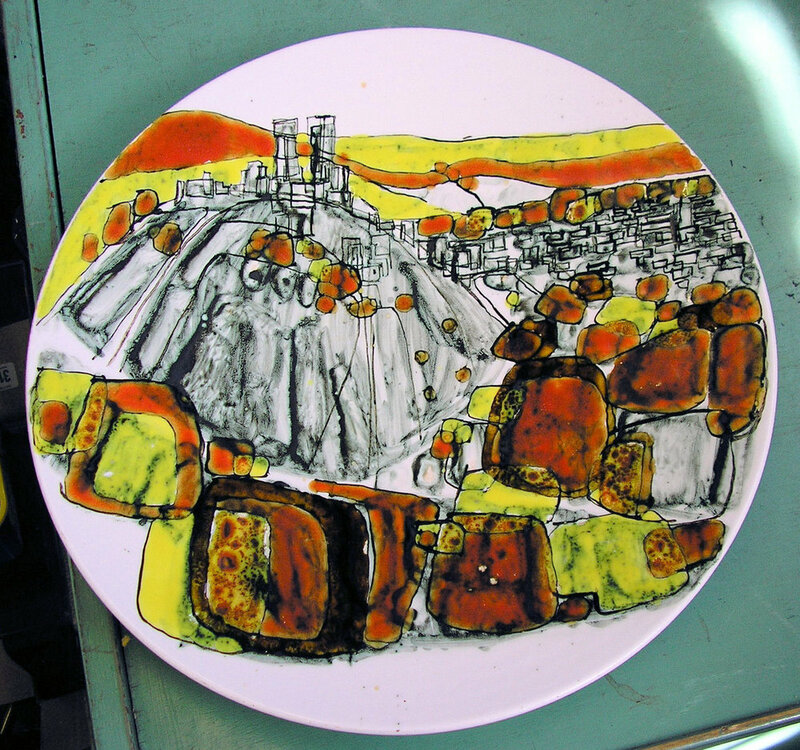 The plate was sold by Christies in 2001 and features in Robert Prescott-Walker's book, although the image in the book is shown in reverse. Above - wall plaque by Tony Morris and, unusually, incorporating Tony's initials as part of the design. The design was inspired by the sculptures of Eduardo Paolozzi who created animal presences ('frogs') in the 1950's by an accumulation of objects and detail including piano parts. The Tony Morris design shows a piano with four legs but the overall effect is that of an animal. Above - Corfe Castle in Dorset. Left - by Tony Morris, the right hand plate unsigned. 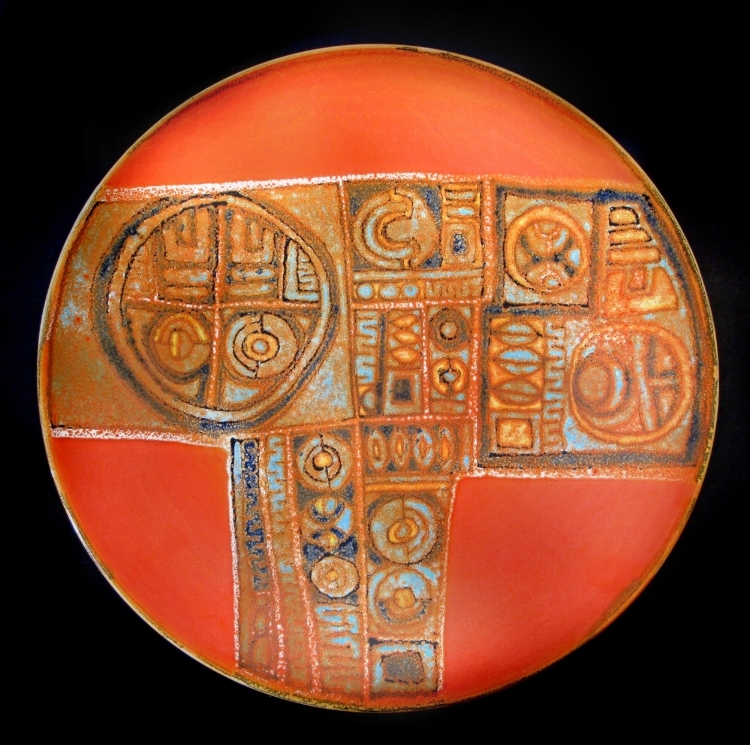 Above - 8 inch Tony Morris plate showing early use of the orange red-glaze brought back by Tony Morris and Guy Sydenham from their trip to Vallauris in France in 1966. Below - a selection of designs on 8 inch plates. Out of all of these only three are signed (two by Ruth Paveley, one by Betty Bantten). Seventeen are known to be by Tony Morris. One of them was broken when a jar of Marmite fell on it. A few of them are radioactive. Above - a spectacular full sized charger (unsigned) but possibly by Christine Tate . 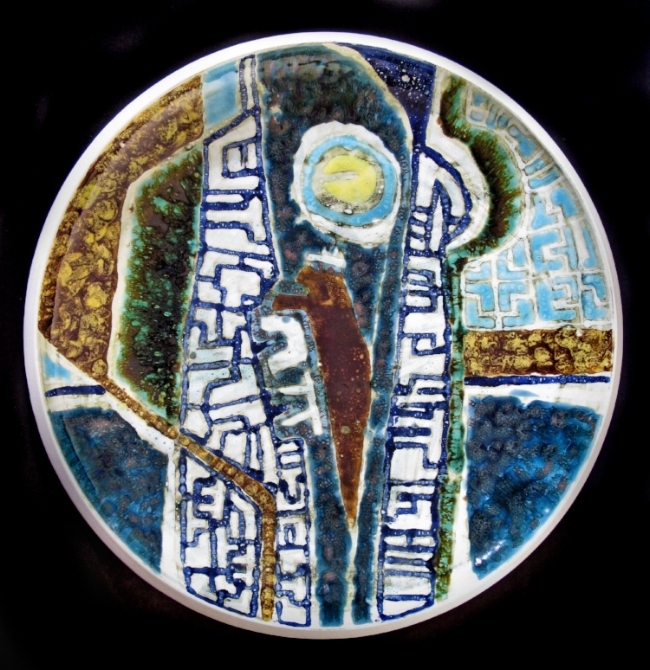 This piece was displayed on the wall of the new Craft Section at poole Pottery in 1966 and can be seen in the contemporary photo on page 146 of Hayward and Atterbury. 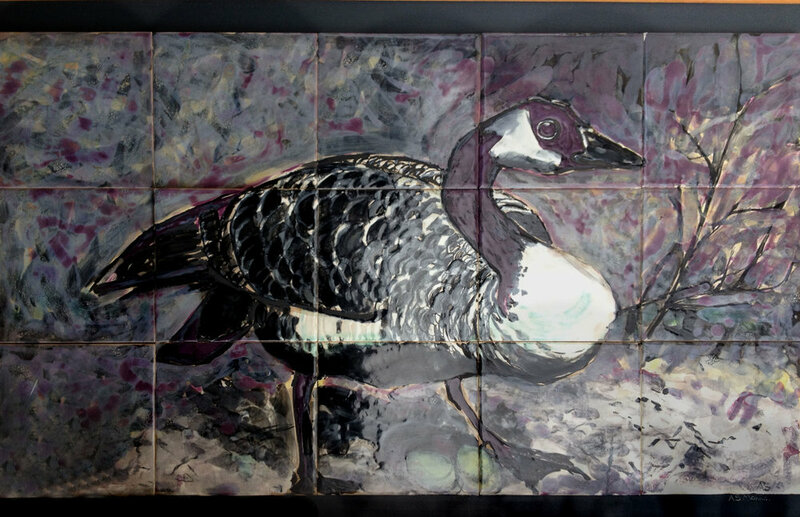 Above - tile panel approx 3 feet long by 18 inches high, painted by Tony Morris. The view is of Poole Harbour from below Evening Hill. Above - the Custom House Poole - tile panel by Tony Morris, 1960's. The panel is on display in Poole Museum. Above and below - Tony Morris tile panels showing the spiny flower heads of the wild teasel. These tile panels are 'Tony Morris' rather than Poole Pottery pieces. Tony made them in his own time but was permitted to sell them in the Factory shop. The slabs have now been framed and mounted high on a brick wall above a flight of stairs in a quayside development. It is possible to imagine a more friendly environment for these important works of art. At least they have been preserved and are on permanent display. In one sense the Poole Pottery Studio was the victim of its own success. Such was the popularity of the Delphis range both at home and overseas that production was increased and more paintresses were recruited. 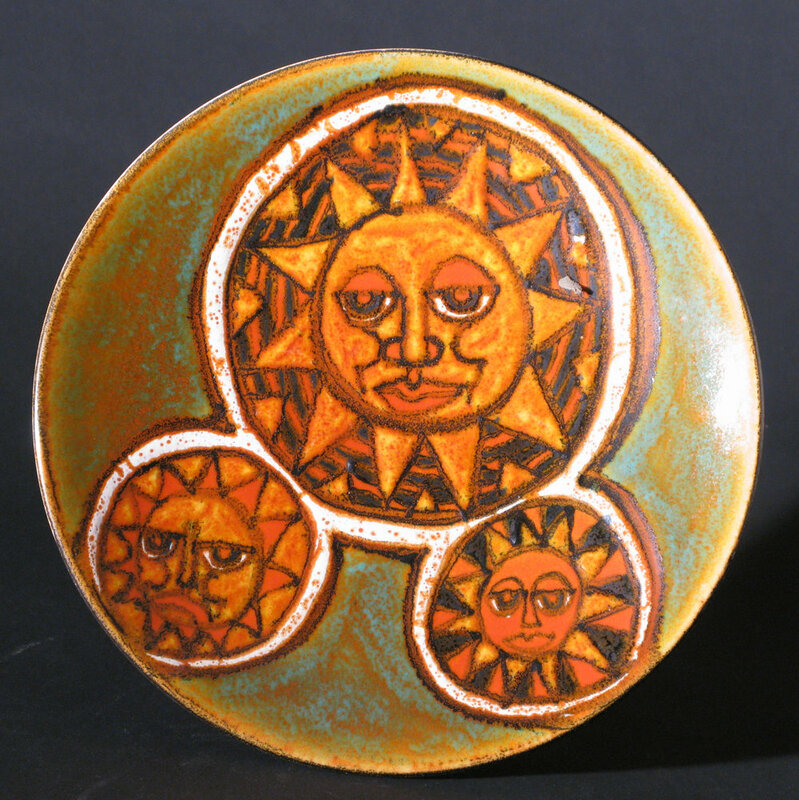 Robert Jefferson left the Pottery at the end of 1965 and was not replaced by a full time designer. Paintresses were (initially at least) given the freedom to create their own designs. In time, production of decorative ware became driven by commercial expediency rather than artistic merit . New glazes were introduced. To speed production (and in the interests of consistency and 'uniformity') the number of glazes available was reduced. By 1971 paintresses were paid according to the number of pieces they produced, with a minimum requirement per day. The freshness, creative design and spontaneity which had been at the heart of the studio philosophy were all but abandoned as designs were diluted and repeated to satisfy the need for mass production.